On March 13, activists of the National Corps movement held another action in the framework of struggle against Russian state banks in Ukraine. This time the activists have literally blocked the invader's financial institution by walling the entrance to central office of the Sberbank of Russia at Volodymyrska Street of Kyiv. 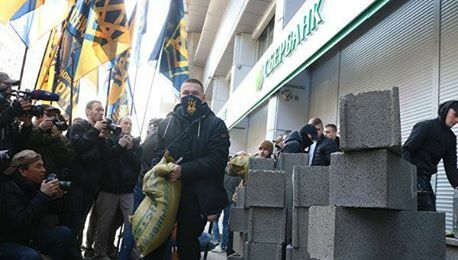 By such radical actions the activists demands the authorities to ban activities of Russian state-run banks throughout Ukraine including, among them the the Sberbank of Russia, VTB Bank and Prominvestbank. At the same time the National Bank representatives says that only the Verkhovna Rada and the National Security and Defense Council have powers to limit the presence of Russian capital in Ukraine. The National Corps movement leader Andriy Biletsky commented the action: Ukrainian authorities are showing more and more examples of national betrayal: the war continues for the third year, but Kremlin's banks are still running in our country. The enemy's financial soldiers, in fact. They have long since been sanctioned in the West because of Russian agression against Ukraine. However, they are free to work in Ukraine, grow and extend their control over the Ukrainian economy and state. At the same time the Russian Foreign Minister Sergei Lavrov called on law enforcement agencies of Ukraine to "applied power" against the activists who are impeding activities of the Russian bank in Ukraine.